Today’s match between the Republic of Ireland and Italy is a make-or-break clincher for Ireland. Ireland needs to beat the Group E winners Italy in Lille and to hope that a few other results go Ireland’s way to make it through to the knockout stages. I have written before on Irish connections with Italy, so I thought it might be interesting this morning to look at some Irish connections with Lille, including some Wexford links and some family links. The coastal city of Lille is in French Flanders, close to the border with Belgium, in northern France. It is the capital of the Hauts-de-France region, and with a population of almost 230,000 it is the fourth largest urban area in France, after Paris, Lyon and Marseille. Lille is often known as the birthplace of Charles de Gaulle. It is an old city, with some buildings dating back to the 13th century. Archaeologists show the area was inhabited from as early as 2000 BC, and the early Gauls who lived in the region included the Menapians. Ptolemy, in his Map of Ireland dating from about AD 150, identifies either Hook Head or Carnsore Point, the River Barrow (Birgos or Birgus), and most of Co Wexford which he says is inhabited by tribes called the Brigantes and the Coriondoi. The place Ptolemy names as Menapia or Manapia is often identified as Wexford town, and a river he calls the Modonnus, with an estuary near Menapia, is often said to be the Slaney. Whether there was any connection between the Menapia of Co Wexford and the Menapia who lived in the Lille area in Roman and pre-Roman times, Lille certainly has many Irish connections, and I am interested in some of the past family connections with Lille too. Following the zeal of the Counter-Reformation, a number of new colleges were founded in Lille in the early 17th century, including a new Irish College in 1610, a Jesuit college in 1611, an Augustinian college in 1622, and almshouses or hospitals such as the Maison des Vieux hommes in 1624. The new Irish college at Lille was founded by Ralph Cusack with a charter from Archduke Albert, and Isabella, Infanta of Spain, the Governors of the Spanish Netherlands. It was set up mainly for the education of students from Leinster, and more particularly from Co Meath. The superior of the Irish Capuchins at Bar-su-Aube had the right to nominate the Rector of the Irish College in Lille. However, the college suffered much from poverty. It was supported mainly by church door collections made at church doors, and partly from the fees the students collected for working at funerals. The study and use of the Irish language was encouraged, and fluency in Irish was an essential qualification to hold the office of rector. Unlike its counterparts in Paris, Bordeaux, Douai or Nantes, the college in Lille was never a big Irish college, and the students, who all came from Leinster, only ever numbered from eight to 10 at any one time. At the French Revolution, the Irish College in Lille was confiscated and it was sold in 1793. Meanwhile, interesting Comerford family links with Lille developed from the late 17th century and continued until the early 19th century. Bonaventure and Luke Comerford were younger brothers of the flamboyant and colourful Joseph Comerford, who bought the Château d’Anglure in the Champagne area and acquired the title of the Marquis d’Anglure. Bonaventure and Luke also moved to France in the 1690s and they became officers in Irish regiments in the French army. Bonaventure Comerford was a captain in the Regiment de Dillon in France and was taken prisoner at the Battle of Malplaquet. He died in 1709 without having any children, and he is buried in the Church of Saint-Pierre in Douai, about 40 km from Lille. Luke or Luc Comerford, who was born in Ireland ca 1673, became a major in the Regiment de Lee. He moved to France with his Irish-born wife Constance Lucy Gough, but she soon died and had no children. The exiled King James II, who had been defeated at the Battle of the Boyne in 1690, signed a declaration in French on 2 January 1700 confirming that Luke Comerford was a gentleman, born to parents of gentle blood in Ireland. Luke later became a Chevalier de Saint-Louis, and he died at Douai at the age of 55 in 1728. He is buried in the Church of Saint-Pierre. His second, French-born wife, Péronne Geneviève de La Porte de Milleray, had died before him, and they were the parents of a daughter who became a nun in Paris and four sons who became captains in regiments in the French army, Louis-Luc Comerford, Pierre-Edouard Comerford, Alexandre Comerford and Germain-Joseph Comerford. The youngest son, Germain-Joseph Comerford, had no children, and died in his 80s in Montdidier in northern France in 1783 without ever marrying. So the Comerford family in north-east France, including Lille and Douai, is traced through his three elder brothers. The eldest brother, Louis-Luc Comerford, became a captain in the Regiment de Bulkeley and was a Chevalier de Saint-Louis. As the heir to his uncle, Joseph Comerford, Marquis d’Anglure, who died in 1729, Louis-Luc became Seigneur d’Anglure. But Louis-Luc Comerford was financially ruined at an early stage in his career. He sold the Anglure estates around 1752, and moved to Sézanne, 18 km north-west of Anglure and 50 km east of Paris. There he lived in extreme poverty. Although Louis-Luc Comerford was the father of several children, only two of his daughters survived. He died in poverty in Sézanne around 1777, and the title of Marquis d’Anglure never passed to any other member of this branch of the Comerford family. Louis-Luc Comerford’s next brother, Pierre-Edouard Comerford, lived in Lille, and he used the title of Baron Dangermore after his brother’s death. He was a captain in the Regiment de Roth (later Walsh), an Irish regiment in the French army, and became a Chevalier de Saint-Louis. Pierre-Edouard Comerford lived in Lille and had an only daughter who married the Comte d’Armanville. But he also had two illegitimate sons with Marie-Bernardine Devienne. The elder of these two sons, Jean-Pierre-Edouard Comerford, was baptised in Saint-Étienne in Lille in 1728; the younger son, Edouard-Bernard Comerford, baptised at Saint-Étienne in Lille in 1730. Pierre-Edouard Comerford died in 1782 without legitimate male heirs, and so the family representation passed to the children of his next brother, Alexandre Comerford (ca 1698/1702-1748), who also lived in Lille. Alexandre Comerford was a captain in two Irish regiments in the French army, first in the Regiment de Bulkeley and later the Regiment de Dillon, and like his older brothers he too became a Chevalier de Saint-Louis. He was born in Péronne, in northern France, ca 1696-1703 (he was said to be 41 in 1744, but 52 at his death in 1748). He fought in Scotland at the Battle of Falkuer on behalf of the Jacobite Pretender, James III. He married in Saint-Omer Thérèse-Philippine Carton, the widow of Pierre-François Fourdin, and they had one child, Alexandre-Bonaventure de Comerford, who was baptised in Lille in the Church of Saint-Sauveur in 1729. The parish of Saint-Sauveur parish was formed in 1144 and gives its name to the modern-day quartier Saint-Sauveur in Lille. The church, which was rebuilt in the 17th century, stood opposite the town hall, but was destroyed by fire in 1896. The present church was designed by the architect François-Joseph Delemer, and was built at the turn of the 19th and 20th centuries in a neo-Byzantine style, with an elegant bell tower. 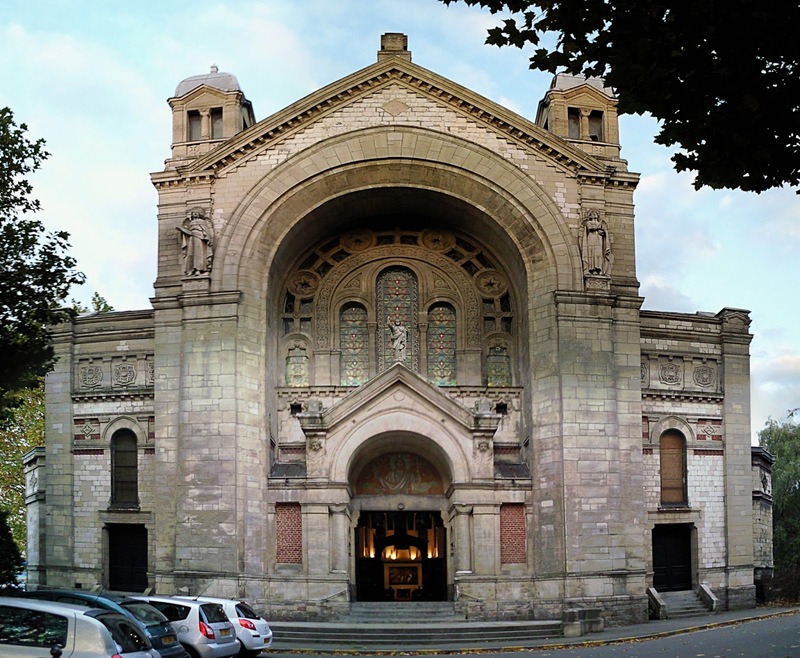 But Alexandre Comerford also had an illegitimate daughter with Isabelle Fortier, Henriette-Joseph, who was baptised in the Church of Saint-Étienne in Lille in 1730 – the same year as her first cousin Edouard-Bernard Comerford. 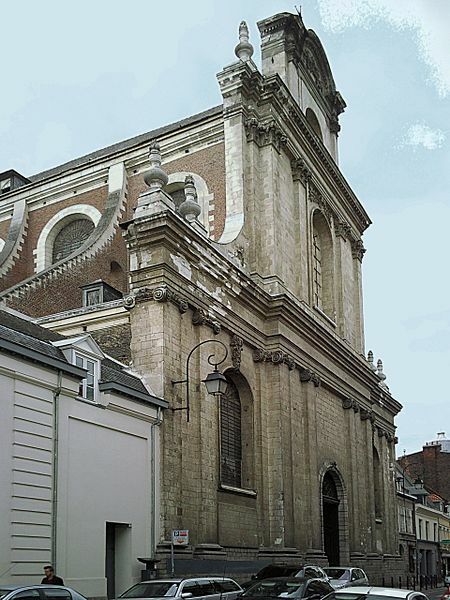 The present church on the rue de l’Hôpital Militaire in Lille, is one of the largest Jesuit churches in France. The original church was built in 1605-1610, but was destroyed by fire in 1740, and the present church was built in 1743. When Alexandre Comerford died in Douai in 1748, he was buried in Saint-Albin, Douai. His only son, Alexandre-Bonaventrue de Comerford (1729-post 1789), who was born in Lille, was a lieutenant in the Regiment de Bulkeley and later a captain of the Grenadiers in the Regiment de Dillon. Like so many members of his family, he too became a Chevalier de Saint-Louis. Alexandre-Bonaventrue de Comerford was present at the Battle of Lawfeld on 2 July 1747 when the French defeated the British under the Duke of Cumberland. After leaving the army, he married Marie-Antoinette Lorgnier in Dunkirk (Dunkerque) in 1752. She was a daughter of Antoine Lorgnier, a lawyer, and his wife, Dorothée Derycke. Alexandre-Bonaventrue and Marie-Antoinette de Comerford moved to Douai, where they were the parents of two sons: Alexandre-Dominique-Joseph Comerford (1754-1755) was baptised at Saint-Pierre in Douai in 1754, but died in infancy at Goeulzin, near Calais, in 1755; and Joseph-Alexandre-Antoine Comerford (1757-1813). After the death of his uncle, Pierre-Edouard Comerford, in 1782, he called himself Baron Dangermore. In 1789, just before the outbreak of the French Revolution, he was still listed as a captain in the Regiment de Dillon when he took part in the electoral assembly of the nobility in Douai. Alexandre-Bonaventrue de Comerford’s only surviving son, Joseph-Alexandre-Antoine de Comerford (1757-1813), called himself Baron de Comerford in later life. He was a Sub-Lieutenant in 1777, and he was a captain in the Regiment of Grenadiers in Dillon’s Infantry from 1782 to 1786, when he fought in the French army in North America during the American War of Independence. Later he was a commandant of the National Guard in Douai, and too became a Chevalier de Saint-Louis. Joseph-Alexandre-Antoine de Comerford was married twice. His first wife was Marie-Thérèse-Gabrielle d’Assenoy; in 1804, in Aire-sur-la-Lys, near Calais, he married his second wife, Marie-Joseph-Adélaïde de Lencquesaing (1757-1836). He died in Aire-sur-la-Lys in 1813, and his widow died in 1836. Joseph-Alexandre-Antoine de Comerford, Baron de Comerford, had no children, and so this line of the Comerford family came to an end almost a century and a half after they first moved from Ireland to France. Since then the family titles have not been used by any other members of the Comerford family. JB Rietstap’s Armorial gives these arms for the French branch of the Comerford family: Écartelé: aux 1 et 4, de gueules, à un chien mâtin d’argent, passant; aux 2 et 3, de gueules, à la croix engrêlée d’or, ch. de cinq roses du champ. Supports: deux paons, au naturel. Quarterly 1 and 4, gules, a talbot passant argent; 2 and 3, gules, a cross engrailed or charged with five roses of the field. Supporters: Two peacocks proper. These are the arms of the Comberford family of Comberford, Staffordshire. The Comerford family of Douai and Aire-sur-la-Lys used: Armes: Soit de gueules, écartelé aux 1 et 4 au chien matin passant d’argent; aux 2 et 3 à la croix engrêlée d’or, chargée de cinq roses de gueules. Quarterly, 1 and 4, gules, a talbot passant argent; 2 and 3, a cross engrailed or, charged with five roses of the field. These too are the arms of the Comberford family of Comberford. Another version of their arms was: Quarterly: 1, gules, a talbot passant argent; 2 and 3, azure, a coronet argent, stringed gules, between three mullets or; 4, gules, a cross engrailed or, charged with five roses of the field. These arms were crowned with a baron’s coronet, and a peacock’s head for a crest. These are the arms of the Comberford family of Comberford in the first and fourth quarter, with those of the Comerford family of Co Kilkenny in the second and third quarter. The supporters were described as two tigers, although these may properly have been the two Irish wolfhounds used by Joseph Comerford as his supporters. Motto: So, ho, Dea, ne. ● Today’s match between Ireland and Italy kicks off at the Stade Pierre-Mauroy in Lille at 8 p.m. [22 June 2016].